• Heat the olive oil and butter together in a sauce pot, add the leeks, onions, carrots, celery and Thyme on medium high heat. Cook this mixture for about 10 to 15 minutes until the mirepoix is fragrant and until the veggies are soft. • Then add the lemon zest and tomato paste; stir for another 4 minutes. Now add the flour and stir it around so that it coats evenly. Cook this mixture for 2 minutes and then add the lobster concentrate, Cognac/Brandy and water. Stir the bottom to ensure that the brown bits on the bottom of the pot are loosened and mixed into the liquid mixture. • Using a hand held emersion blender; blend the mixture of the soup until it is semi-smooth. 1. Return the soup base to medium high heat and temper in the heavy cream in to the sauce pot and bring to a boil. 2. Immediately, reduce the heat and let it simmer for about 20 minutes or until the soup is reduced and thickened. 3. Add the salt and pepper to the reduced soup base and let it cook for another 5 minutes before taking it off the heat. Take it off the heat and transfer the soup into an appropriate container needed for holding or cooling. Cool it according HACCP Procedures and refrigerate if not using. 4. During service, reheat lobster bisque and to use the diluted Lobster Stock (5 to 1 ratio) to adjust the consistency and thickness of the soup. 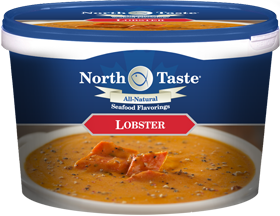 Add the cooked lobster meat and bring the soup to 180F and take it off the heat and serve while still hot and warm. 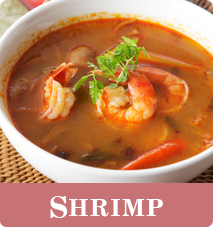 The delicate profile of the All-Natural North Atlantic Shrimp Concentrate will provide your products with a superb shrimp flavor.